Thank you so much to everyone who commented on yesterday’s blog post about gladioli…either on Flowerona, Facebook or Twitter. The general feeling seems to be that gladioli look particularly wonderful en masse, in one colour, on their own, in a tall vase. 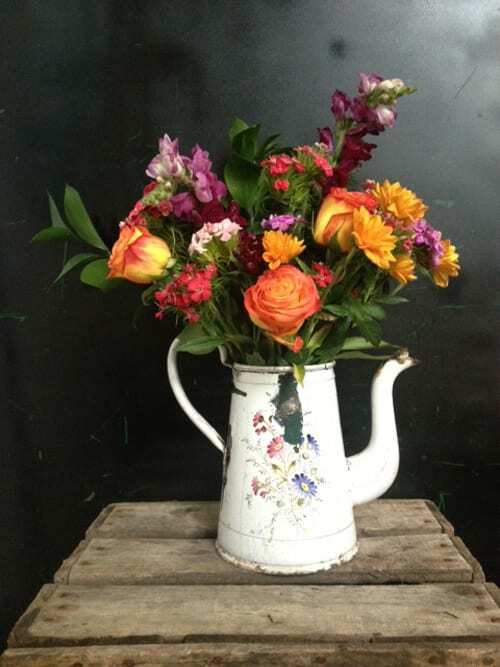 Now on to today, which is Florist Friday…and I’m delighted to feature an interview with Florence Hill of Petalon. Florence and I ‘met’ on Instagram after I posted this image of a flower-adorned bicycle in Bath. She told me that she delivers flowers in London by bicycle…and grew up in Bath! Could you tell us what prompted you to set up Petalon? I wanted to make it easier, more affordable and greener to send flowers. 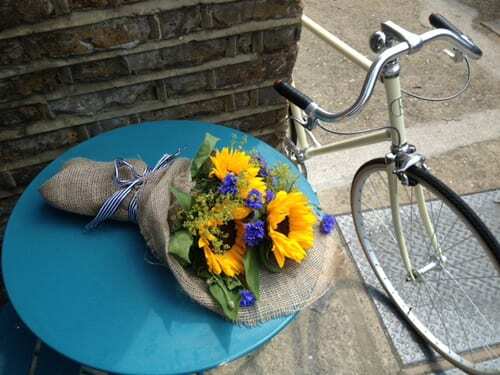 When my boyfriend James started his bicycle brand, it sparked the idea to deliver flowers using his bicycles. And from there, we thought about how we could make the process of sending flowers a bit different and better for everyone. When did you start Petalon and where is it based? We’re about a month old! 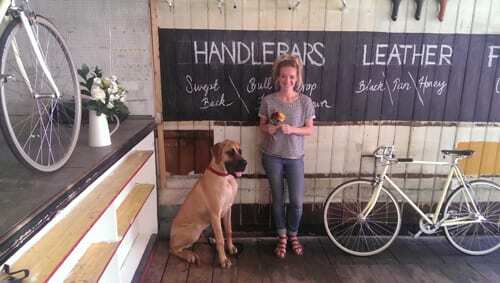 We’re based in Hackney, London where we share our workshop with Kennedy City Bicycles. I collect the flowers, put together the bouquets and deliver them all myself. James helps out with deliveries if it’s really busy, but it’s essentially a one woman show. I’ve done a couple of evening classes covering the basics of creating my own hand-tied bouquets, but have learnt most through online tutorials, books and blogs. Having a design background helps. But the inspiration I get from following florists through social media is invaluable. It’s fantastic to be able to see what’s happening in the industry from all corners of the globe and it fuels my ideas and creations. 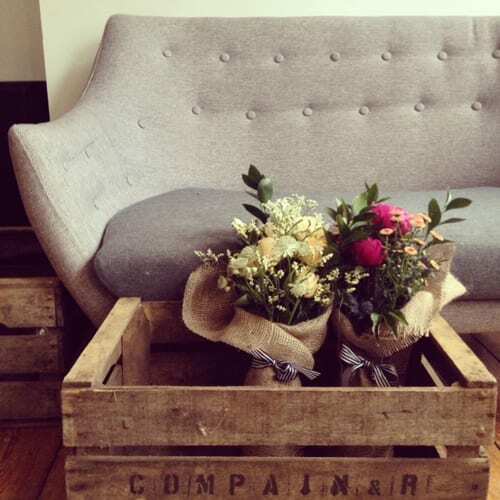 How does your flower delivery service work? 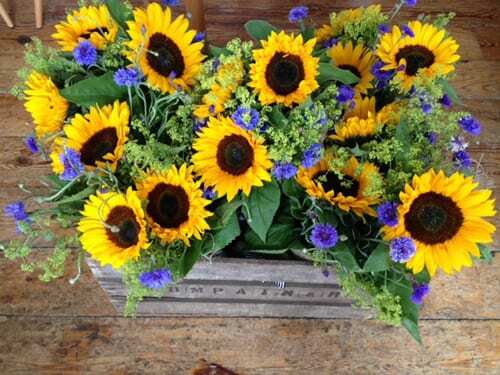 We offer two different bouquets every week, which are always £20 including same day delivery. These flowers change depending on what we find at the Flower Market and what’s in season. By limiting the choice, we reduce any unnecessary waste, keep costs down and can afford to donate £2 of every bunch to Capital Bee, an organisation that campaigns for bee-friendly practices, benefiting both London’s people and pollinators. The new flowers for each week are uploaded onto the website and promoted through all our social media channels (Twitter, Facebook & Instagram). Our mornings are spent taking orders and putting the bouquets together. And our afternoons are spent delivering our flowers by bicycle. Unmanicured. I’ve always loved the natural beauty of flowers, so I try to retain as much of this as possible. Get this business off the ground! We’ve had an incredible start, so now we need to focus on getting more people sending more flowers. Very hard to pick just one! I love Sweet William, either as delicate single stems or the beautiful texture en masse. Thank you very much to Florence for all her help with compiling today’s blog post. I’d like to wish her every success with her new floristry business, which really is ‘different’! If you’d like to keep up-to-date with her news, she’s on Twitter, Facebook and Instagram. P.S. I love the distinctive black and white striped ribbon that she uses on her bouquets! « Gladioli…are they coming back into fashion as a cut flower? “Ive done a couple of evening classes”Sorry but no,theres more to floristry than wrapping flowers in sacking & charging 20.00 ,which I wouldnt pay.Times are hard for florists with supermarkets,chain stores ,garages etc.I trained & worked hard to be a florist,this I think denigrates our profession.Perhaps things are different in london. 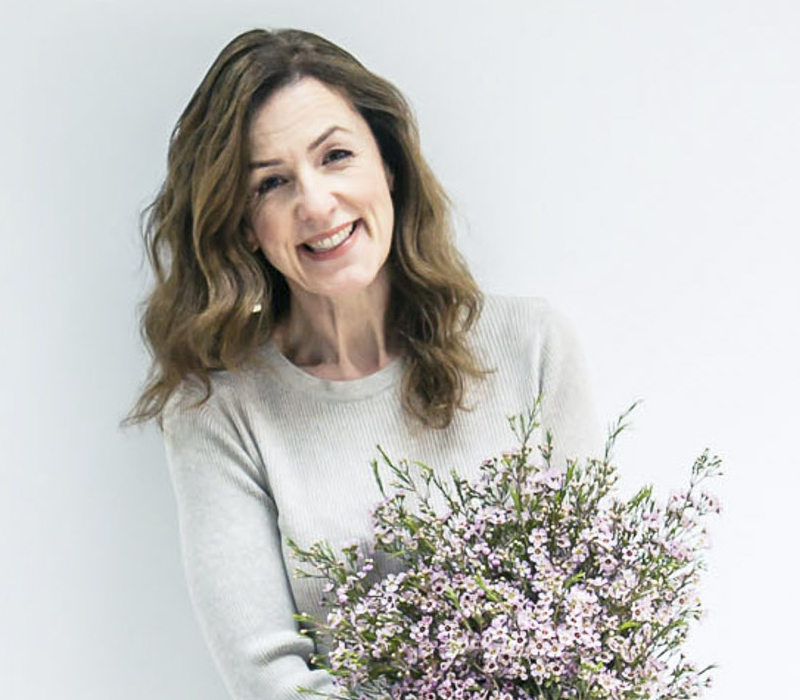 I feel that Florence has captured exactly what my ‘Being different’ blog post on Tuesday is all about and I’m very happy to feature her business on Flowerona. 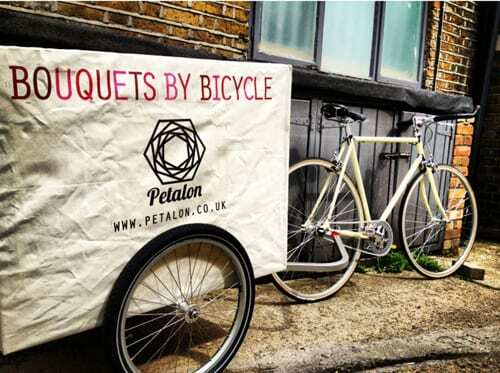 She has found a great niche in the market…beautifully presented ‘bouquets by bicycle’ to brighten up people’s days, whilst they’re living and working in London. I fully admire her entrepreneurial spirit and hope that her business continues to flourish. I’m afraid Elizabeth’s attitude is one I come across all the time amongst other florists, and I find it sad (I’m being polite). An analogy I use is this: If I was teaching french – having spent tens of thousands of pounds on my French degree – I wouldn’t dare tell someone who learnt french simply by living in France for a while that they shouldn’t be teaching it! Spending a lot of time and money learning a skill is NOT the only way to do it. Those who do a bad job do indeed let down the rest of our profession, but they will be weeded out in time. More and more I hear catty florists talking about the ‘kitchen-sink brigade’, and it’s incredibly depressing. They are flowers, not rockets. If one can learn something a different way and make a success of it, that’s brilliant. And the rest of us will have to step up our game. I love this article, it made me smile. Hackney needs flowers! Well I think these bouquets are perfect gifts and just the right price. 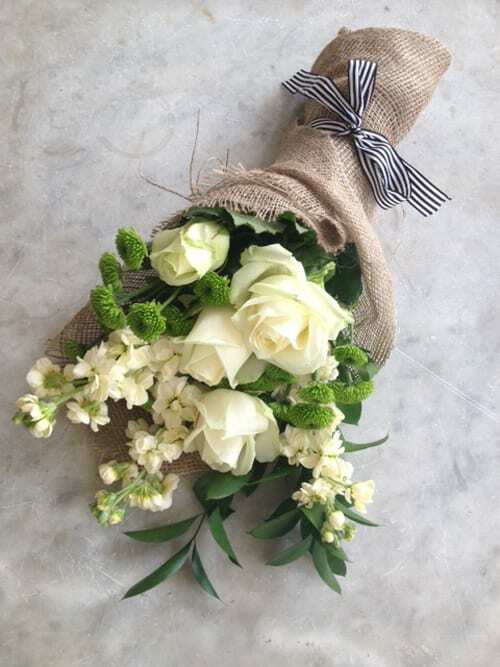 As a trained florist myself they are actually the kind of thing I wrap up for my friends when I want to give. 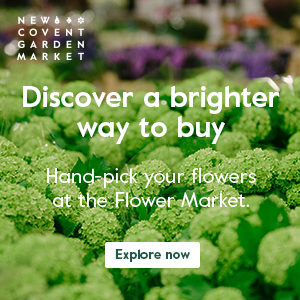 What Florence offers is a more thoughtful than grabbing a bunch from a supermarket or the ready wrapped bunches from a florist shop (which many can’t deliver as often a minimum spend is required). I bet the trendy people of London Fields LOVE the idea. I’ll be sure to mention to some friends that live there. I wish Petalon all the best and I really enjoyed the article thank you Flowerona! I understand what Elisabeth means when people say they’ve done a few evening classes and then started, when others have done lots of courses, but there’s room for everyone to do their particular style, and I really like what she’s done! 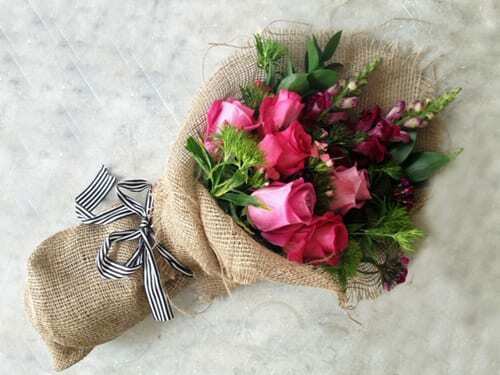 I also think its an excellent idea to offer just 2 types of bouquet each week and have one price. In our complicated world, isn’t it nice to come across something simple and straight forward??!! Thank you so much Scarlet, Jo and Jackie for your comments. I really appreciate you taking the time to put ‘pen to paper’ and hope you all have lovely weekends :-). I think this is a great idea and wish Florence lots of luck, i can imagine it will be very popular in London- and kudos for battling with the traffic! I think there are some funny attitudes in how you should learn floristry, some of which i have experienced first hand; i don’t think you should be judged by how you got into the profession, but instead by the quality of work you are producing; i’ve noticed there are more florists opening businesses who have came from an art or design background (me being one of them!) and i think it often offers an alternative to more traditional floristry, but it doesn’t mean there isn’t room for both styles. Thank you so much Linzi and Anthony for you wonderful comments! 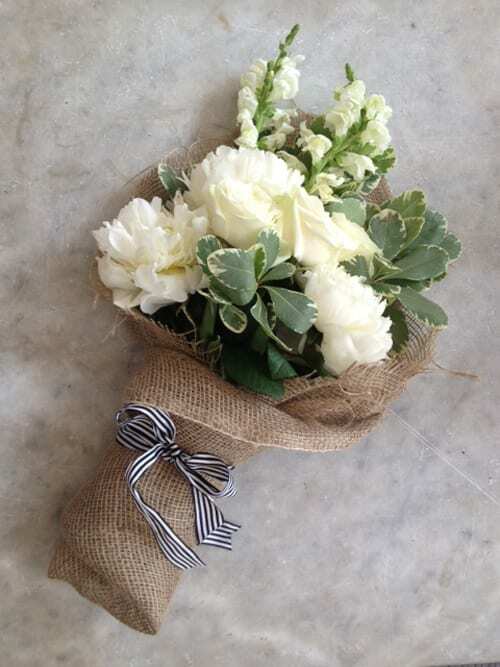 The idea of fresh, beautiful, cheerful and simple flowers without the usual price tag ( for example ) a small thank you gift cannot be compromised within this concept. Great idea, great value for money, fully recommend. wishing Petalon all the best. Thank you very much for your comment Sham :-).